Concrete is subjected to changes in volume either autogenous or induced. Volume change is one of the most detrimental properties of concrete, which affects the long-term strength and durability. 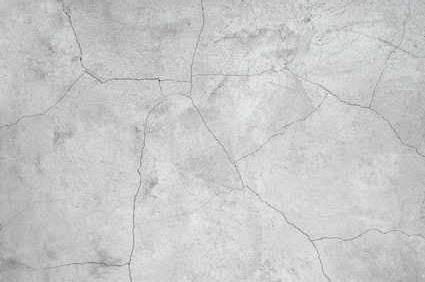 To the practical engineer, the aspect of volume change in concrete is important from the point of view that it causes unsightly cracks in concrete and called concrete shrinkage. Concrete Shrinkage is the change in length per unit length and is, therefore, a dimensional number expressed as percent. Shrinkage is time-dependent and its value includes plastic shrinkage, autogenous shrinkage, drying shrinkage, and carbonation shrinkage usually quantified in terms of micro strain which is equal to 1x10^-6 in/in or 1x10^-6 m/m. We have discussed elsewhere the effect of volume change due to thermal properties of aggregate and concrete, due to alkali/aggregate reaction, due to sulphate action etc. Presently we shall discuss the volume change on account of inherent properties of concrete “shrinkage”. One of the most objectionable defects in concrete is the presence of cracks, particularly in floors and pavements. One of the important factors that contribute to the cracks in floors and pavements is that due to shrinkage. It is difficult to make concrete which does not shrink and crack. It is only a question of magnitude. Now the question is how to reduce the shrinkage and shrinkage cracks in concrete structures. The term shrinkage is loosely used to describe the various aspects of volume changes in concrete due to loss of moisture at different stages due to different reasons. Plastic shrinkage is contraction in volume due to water movement from the concrete while still in the plastic state, or before it sets. This movement of water can be during the hydration process or from the environmental conditions leading to evaporation of water that resides on the surface on the wet concrete. So, the more the concrete bleeds, the greater the plastic shrinkage should be. Plastic shrinkage is proportional to cement content and, therefore, inversely proportional to the w/c ratio. Concrete shrinkage of this type manifests itself soon after the concrete is placed in the forms while the concrete is still in the plastic state. Loss of water by evaporation from the surface of concrete or by the absorption by aggregate or subgrade, is believed to be the reasons of plastic shrinkage. The loss of water results in the reduction of volume. The aggregate particles or the reinforcement comes in the way of subsidence due to which cracks may appear at the surface or internally around the aggregate or reinforcement. In case of floors and pavements where the surface area exposed to drying is large as compared to depth, when this large surface is exposed to hot sun and drying wind, the surface of concrete dries very fast which results in plastic shrinkage. Sometimes even if the concrete is not subjected to severe drying, but poorly made with a high water/cement ratio, large quantity of water bleeds and accumulates at the surface. When this water at the surface dries out, the surface concrete collapses causing cracks. 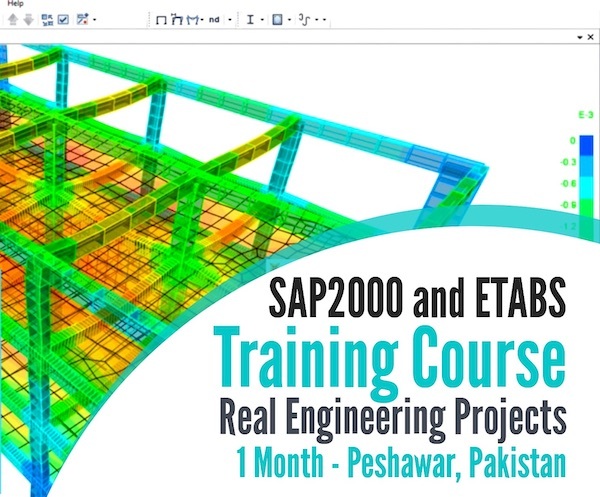 Plastic concrete is sometimes subjected to unintended vibration or yielding of formwork support which again causes plastic shrinkage cracks as the concrete at this stage has not developed enough strength. From the above it can be inferred that high water/cement ratio, badly proportioned concrete, rapid drying, greater bleeding, unintended vibration etc., are some of the reasons for plastic shrinkage. It can also be further added that richer concrete undergoes greater plastic shrinkage. Plastic shrinkage in concrete can be reduced mainly by preventing the rapid loss of water from surface. This can be done by covering the surface with polyethylene sheeting immediately on finishing operation; by fog spray that keeps the surface moist; or by working at night. Use of small quantity of aluminium powder is also suggested to offset the effect of plastic shrinkage. Similarly, expansive cement or shrinkage compensating cement also can be used for controlling the shrinkage during the setting of concrete. Just as the hydration of cement is an ever lasting process, the drying shrinkage is also an ever lasting process when concrete is subjected to drying conditions. The drying shrinkage of concrete is analogous to the mechanism of drying of timber specimen. The loss of free water contained in hardened concrete, does not result in any appreciable dimension change. It is the loss of water held in gel pores that causes the change in the volume. Under drying conditions, the gel water is lost progressively over a long time, as long as the concrete is kept in drying conditions. Cement paste shrinks more than mortar and mortar shrinks more than concrete. Concrete made with smaller size aggregate shrinks more than concrete made with bigger size aggregate. The magnitude of drying shrinkage is also a function of the fineness of gel. The finer the gel the more is the shrinkage. Autogeneous shrinkage, also known as “basic shrinkage,” is the shrinkage due to chemical reactions between cement with water, known as hydration, and do not include environmental effects such as temperature and moisture changes. Its magnitude is usually ignored in concretes with w/c more than 0.40. In a conservative system i.e. where no moisture movement to or from the paste is permitted, when temperature is constant some shrinkage may occur. The shrinkage of such a conservative system is known as autogeneous shrinkage. Autogeneous shrinkage is of minor importance and is not applicable in practice to many situations except that of mass of concrete in the interior of a concrete dam. Carbon dioxide present in the atmosphere reacts in the presence of water with hydrated cement. Calcium hydroxide [Ca(OH)2] gets converted to calcium carbonate and also some other cement compounds are decomposed. Such a complete decomposition of calcium compound in hydrated cement is chemically possible even at the low pressure of carbon dioxide in normal atmosphere. Carbonation penetrates beyond the exposed surface of concrete very slowly. The rate of penetration of carbon dioxide depends also on the moisture content of the concrete and the relative humidity of the ambient medium. Carbonation is accompanied by an increase in weight of the concrete and by shrinkage. Other factors that have an effect on the magnitude of shrinkage include mix proportions, material properties, curing methods, environmental conditions, and geometry of the specimen. Water content has been found to affect the magnitude and rate of drying shrinkage in concrete. Other factors include elastic properties of the aggregate used in the concrete mix; in general, aggregate with a high elastic modulus will produce low shrinkage concrete. Aggregates which contain clay minerals will affect shrinkage behavior as well. One of the most important factors that affects concrete shrinkage is the drying condition or in other words, the relative humidity of the atmosphere at which the concrete specimen is kept. If the concrete is placed in 100 per cent relative humidity for any length of time, there will not be any shrinkage; instead there will be a slight swelling. The typical relationship between shrinkage and time for which concrete is stored at different relative humidities is shown in Figure. The graph shows that the magnitude of shrinkage increases with time and also with the reduction of relative humidity. The rate of shrinkage decreases rapidly with time. It is observed that 14 to 34 per cent of the 20 year shrinkage occurs in 2 weeks, 40 to 80 per cent of the 20 year shrinkage occurs in 3 months and 66 to 85 per cent of the 20 year shrinkage occurs in one year. Another important factor which influences the magnitude of shrinkage is water/cement ratio of the concrete. The richness of the concrete also has a significant influence on shrinkage. Aggregate plays an important role in the shrinkage properties of concrete. The quantum of an aggregate, its size, and its modulus of elasticity influence the magnitude of drying shrinkage. Harder aggregate with higher modulus of elasticity like quartz shrinks much less than softer aggregates such as sandstone. Concrete shrinks when allowed to dry in air at a lower relative humidity and it swells when kept at 100 per cent relative humidity or when placed in water. Just as drying shrinkage is an ever continuing process, swelling, when continuously placed in water is also an ever continuing process. If a concrete sample subjected to drying condition, at some stage, is subjected to wetting condition, it starts swelling. 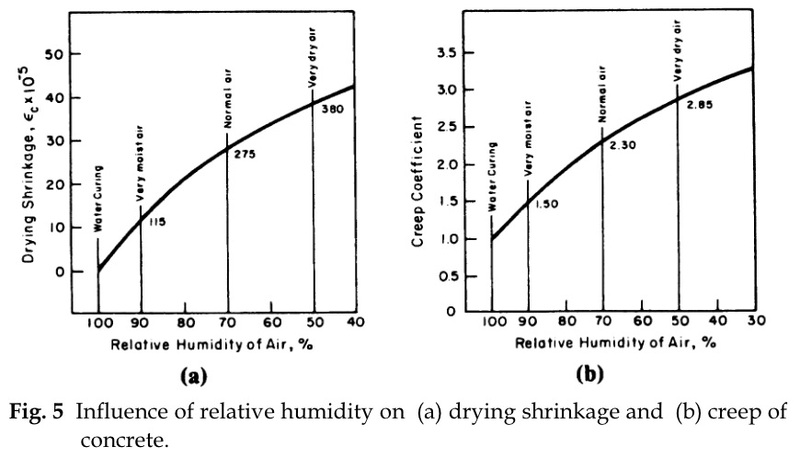 It is interesting to note that all the initial drying shrinkage is not recovered even after prolonged storage in water which shows that the phenomenon of drying shrinkage is not a fully reversible one. Just as the drying shrinkage is due to loss of adsorbed water around gel particles, swelling is due to the adsorption of water by the cement gel. The water molecules act against the cohesive force and tend to force the gel particles further apart as a result of which swelling takes place. In addition, the ingress of water decreases the surface tension of the gel. The property of swelling when placed in wet condition, and shrinking when placed in drying condition is referred as moisture movement in concrete. Different aggregate type will have different properties and will therefore have different effects on concrete shrinkage. In general, concretes made with high moduli of elasticity non- shrinking aggregates will have low shrinkage. The size and shape of coarse aggregate influence the loss of moisture and it has therefore an indirect effect on the shrinkage of concrete. In general, the smaller the aggregate size, the more surface area, more water is absorbed as a result and, therefore, more shrinkage. This means that whenever low shrinkage is desired, largest aggregate size should be used.